Arsenal have been given an update of sorts in regards to a possible successor for Arsene Wenger following his shock decision to quit as manager today. The Frenchman announced this morning that he would be stepping down as Gunners boss at the end of the season and a host of big names have been linked as potential replacements. MORE: Messi to Arsenal if THIS manager replaces Wenger? Wenger will prove a hard act to follow at the Emirates Stadium and one of the leading contenders to take the job is rumoured to be former Chelsea, Real Madrid and Bayern Munich boss Carlo Ancelotti. The Italian tactician was linked with the job earlier this season by Gazzetta dello Sport and his name is one of many to come up in discussions today as pundits and fans alike ponder who could be next in line at Arsenal. 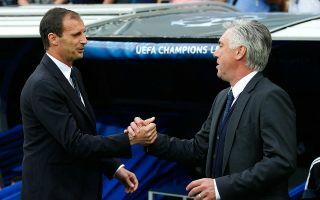 Ancelotti has enjoyed plenty of success in a number of different leagues throughout his career and could be a wise appointment for Arsenal, and he admits he’s pleased to be being talked about in relation to replacing Wenger. ‘He (Wenger) decided to leave and it was a great gesture of solidity,’ Ancelotti is quoted by Goal. ‘He made history, and he has to be recognised for that. ‘The Gunners know their own future, if their plans involve me then I’m pleased from a professional point of view, but at the moment there’s nothing else.